When I was given the opportunity to review “The Tao of Sudoku: Yoga for the Brain” by Cristina and Rick Smith, I was intrigued, but also a bit intimidated. Full disclosure, I’m a crosswords kind of gal and Sudoku is a numbers gig. Ultimately, though, my curiosity and competitive nature got the better of me and I must say I was the full beneficiary in this endeavor. While I’ve never actually heard the term ‘yoga for the brain’ before, it makes total sense. It’s a well-known fact you have to exercise your brain just as you exercise your body. I consider myself a relatively new Yogi, starting my practice just a few years ago. I fell in love immediately with the many benefits, physically, mentally and spiritually. “The Tao of Sudoku” easily fulfills the mental and spiritual aspects of a Yoga practice. The book begins with an explanation of the Tao as an approach to life in a spiritual and philosophical manner. It goes on to encourage the reader to learn, grow and evolve, by incorporating the 100 puzzles in the book as part of the process toward self-realization. At the bottom of each puzzle, there is a phrase for consideration, food-for-thought, so to speak, encouraging the reader to dig deeper into reflection and meditation. 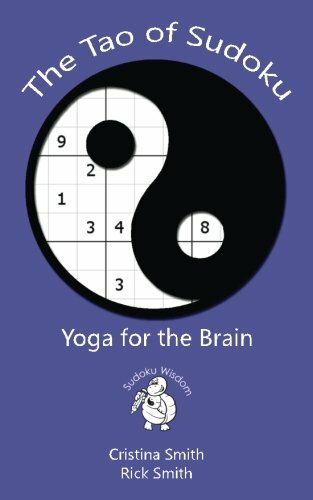 So much more than a puzzle book, the fun facts, history, and education lining the pages make “The Tao of Sudoku: Yoga for the Brain” by Cristina and Rick Smith a unique treasure and I highly recommend it for an entertaining and enlightening experience!